The Seven Days battles ended with a tremendous roar at Malvern Hill on July 1, 1862. The contending armies collided for the final time that week on ground that gave an immense advantage to the defenders—in this case McClellan’s Army of the Potomac. With the security of the James River and the powerful United States Navy at his back, McClellan elected to stop and invite battle. The Confederates, elated by their victories but frustrated by their inability to achieve truly decisive battlefield results, obliged McClellan by attacking Malvern Hill. The hill itself was a modest elevation about 2 ½ miles north of the James River. Its strength lay not in its height, but rather in its fields of fire. Gently sloping open fields lay in front of the Union position, forcing any Confederate attacks against the hill to travel across that barren ground. McClellan unlimbered as much artillery as he could at the crest of the hill, facing in three directions. Nearly 70,000 infantry lay in support, most of them crowded in reserve on the back side of the hill. General Lee recognized the power of Malvern Hill. In tandem with James Longstreet, one of his top subordinates, Lee devised a plan where Confederate artillery would attempt to seize control of Malvern Hill by suppressing the Union cannon there. Lee believed his infantry could assault and carry the position if they did not have to contend with the fearsome Union batteries. The Confederate bombardment failed, but Lee’s infantry attacked anyway, thrown into the charge after a series of misunderstandings and bungled orders. Lee himself was absent when the heaviest fighting erupted. He was away looking for any alternate route that would allow him to bypass Malvern Hill. But once the attack started, Lee threw his men into the fray. Some twenty separate brigades of Southern infantry advanced across the open ground at different times. As the Confederate leaders had feared, the Federal batteries proved dominant. Most attacks sputtered and stalled well short of the hill’s crest. Occasionally McClellan’s infantry, commanded by Fitz John Porter, George Morell, and Darius Couch, sallied forward to deliver a fatal volley or two. Pieces of Confederate divisions led by D. H. Hill, Benjamin Huger, D. R. Jones, Lafayette McLaws, Richard S. Ewell, and W. H. C. Whiting advanced at different times, always without success. General John B. Magruder organized most of the attacks. Late in the day, a few Union brigades and some fresh artillery raced to the hilltop in support. But in fact only a small segment of the Army of the Potomac saw action at Malvern Hill. The dominance of the position enabled less than one-third of the Union army to defeat a larger chunk of the Confederate army at Malvern Hill. As with each of the other battles during the dramatic week, darkness concluded the action. Malvern Hill had demonstrated the power and efficiency of the Union artillery in particular. Confederate leaders and soldiers alike could look back on poor command and control as the principal cause of their defeat. The casualty totals were more balanced than expected for a battle in which the outcome never was in doubt. Slightly more than 5000 Confederates fell killed and wounded, while roughly 3000 Union soldiers met a similar fate. The last of the Seven Days battles bears a reputation today grounded on geography: an imposing hill, stoutly defended by Union cannoneers, against which the Confederate leaders hurled waves of infantry in ill-coordinated frontal assaults. All of that is true, but first-time visitors to the well-preserved battlefield inevitably see something different than they imagined. 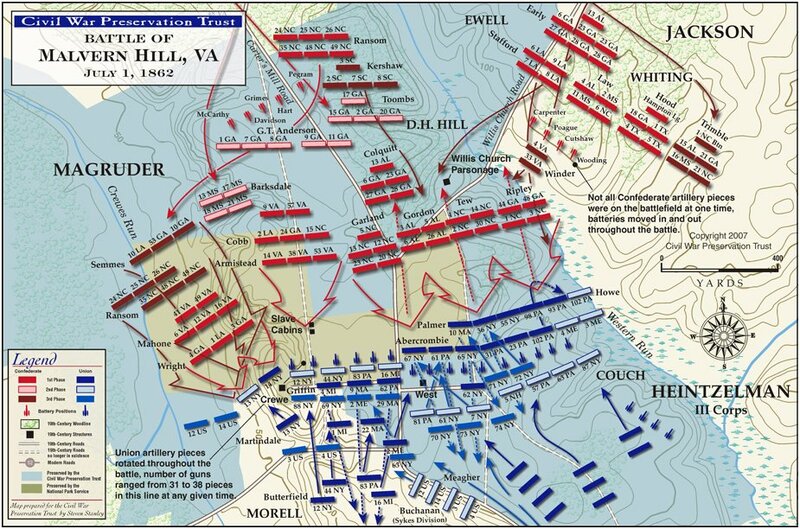 The hill at Malvern Hill is no mountain; it is a gentle slope. Anyone walking in the footsteps of the unfortunate Confederate infantry immediately learns that the reality of the landscape is different than the menacing precipice expected from reading the reminiscences of men who were on the spot in 1862. 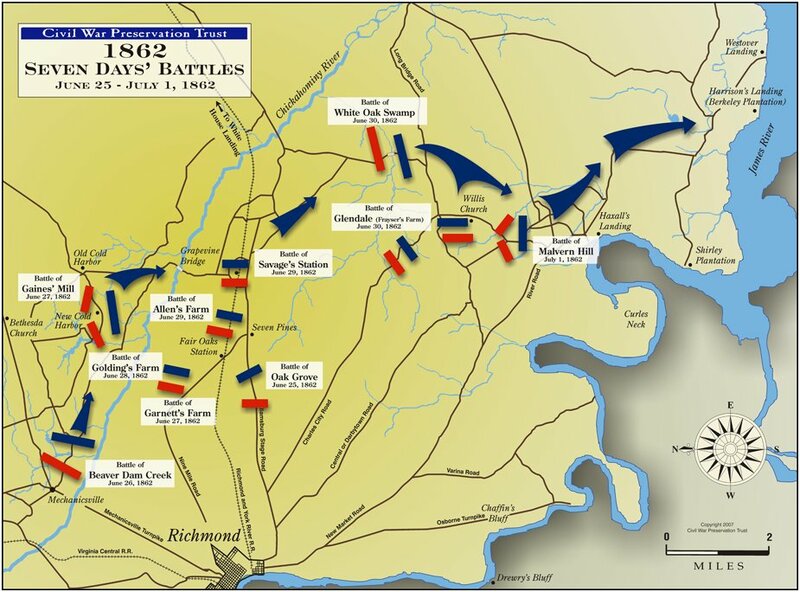 The series of events that reached their denouement at Malvern Hill began on June 26, 1862, when the Confederate army of R. E. Lee initiated offensive operations outside Richmond. “Stonewall” Jackson’s command swept in above and behind George McClellan’s Federal army near Mechanicsville. In the course of 100 memorable hours, the armies marched and fought across a broad corridor east of Richmond. McClellan applied all his energy to removing his army to the James River. Lee was determined to stop McClellan from escaping. An inconclusive battle at Glendale (Frayser’s Farm) on June 30 gave the Union army the time and cushion it needed to reach the river. Mighty gunboats roamed the James, representing safety and continued security for the harassed Federalists. Lee’s frustration at McClellan’s June 30 escape boiled over on the next morning. He snapped at innocent questions and chafed at delays. His chance to inflict a really crushing, war-changing defeat on the Union army had passed. Now the Federals had stopped atop Malvern Hill, in easy range of the James, and prepared for defense. The men in blue hoped that Lee would be imprudent enough to attack their new position, giving them an opportunity to exact revenge for their weeklong series of defeats. 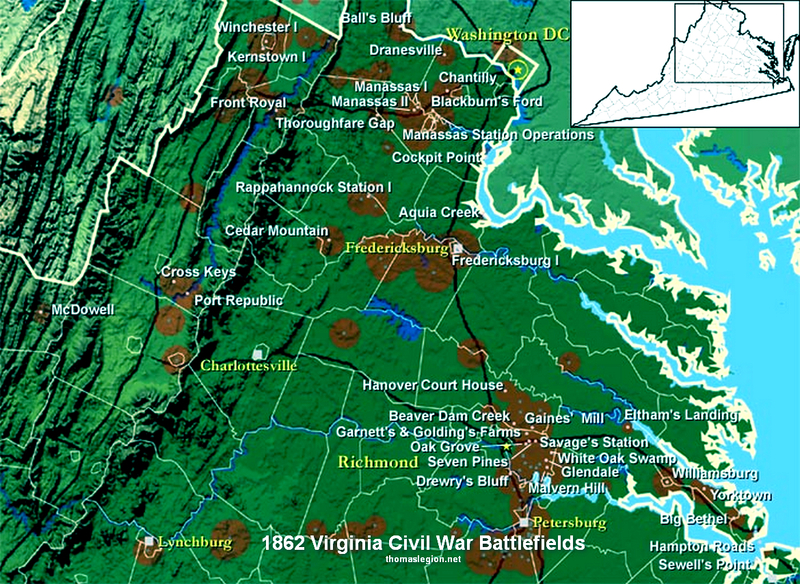 Malvern Hill is more suitable for defense than most spots in central Virginia. In 1862 the nearest body of Confederate-held trees stood approximately 800 yards from the crest of the hill, and in most directions the distance was closer to a full mile. When Lee’s men finally attacked late in the afternoon, most of them spent a deadly ten or fifteen minutes ascending gently rising, open ground. Union artillerists rejoiced at their opportunity and delivered cannon fire of unprecedented violence on the Confederate infantry. General Lee had no intention of making a frontal assault directly up the dangerous hill. Initially he developed a scheme where his artillery, deployed at widely separated spots, would drop a converging fire on the Union batteries at the crest of Malvern Hill and silence the menacing guns. Only then did Lee feel that his infantry stood a good chance of carrying the hill by direct assault. The crossfire bombardment failed badly, yet Lee’s men attacked anyway, thrown into the charge after a series of misunderstandings and bungled orders. Lee seems not to have been on the battlefield when the main attacks started. Instead, he was off looking for a non-existent way to get around McClellan’s army and cut him off from the James River. The precise sequence of events eludes historians even to this day. Some of Lee’s subordinate commanders operated under obsolescent orders. Confusion about the ground and the relative positions of various units further complicated the situation. Whatever the origin, about 35,000 men of Lee’s army eventually stepped off into the assault up Malvern Hill, many of them going forward incrementally, without plan or purpose. McClellan’s trusted subordinate Fitz John Porter had tactical command of the hill’s defense. General Morell’s division of Porter’s own Fifth Corps filled one side of the hilltop, General Couch’s Fourth Corps division defended the other. Opposite Morell, a vast miscellany of Confederates tested the position. Men from the divisions of D. H. Hill, D. R. Jones, Lafayette McLaws, Benjamin Huger, and J. B. Magruder all charged and suffered. One North Carolina soldier struggled to explain just how awful it was, finally resorting to the ultimate superlative: “The enemy opened the most terrific and destructive fire…that ever any troop met since the world began.” On Couch’s front, wrinkles on the front slope of Malvern Hill could have permitted aggressive Confederates to get within rifle range of the Union cannon. Couch blocked that eventuality by putting his own infantry there, producing short-range firefights with some of Stonewall Jackson’s men. Periodically a Federal six-gun battery expended all its ammunition, or an infantry brigade fired off all its cartridges. In every instance ready replacements hurried up and seamlessly filled in. Toward dusk a few Confederate brigades found new lines of approach, using the steeply angled face of the western slope to protect their route. Those formations got closer than their predecessors—a few within 75 or 100 yards of the cannon—but no Confederate reached the crest of the hill. When the last explosive musket flashes died out after dark, some 8000 men lay dead and wounded across a few hundred gruesome acres. More than 5000 of that number wore gray, victims of one of the most ill-managed and uncoordinated major assaults of the entire Civil War. A dense, gloomy rain greeted early risers on July 2. 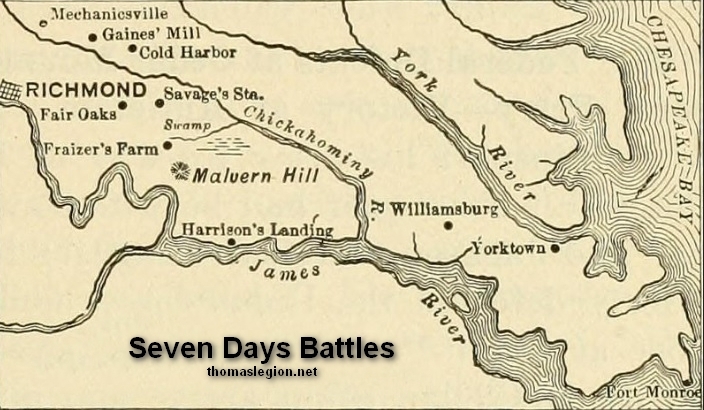 The United States troops were gone, having abandoned Malvern Hill overnight and marched to a secure supply base at Harrison’s Landing on the James River. The Confederates controlled Malvern Hill, the object of their assaults the day before, but Lee wanted to harm the Union army, to inflict a crippling defeat on it. Possession of Malvern Hill did him no good at all, and in a few days the Confederates shortened their lines and moved back closer to Richmond, signaling the end of the Seven Days Campaign. A Union victory by any definition, the Battle of Malvern Hill produced no critical results in the progress of the war. The outcome of the campaign had not been in doubt before Malvern Hill; only the degree of McClellan’s defeat east of Richmond remained to be resolved. Two defining themes emerged from the battle: the absence in the Confederate army, on that day, of what the modern armed forces term “command and control”; and the influence of the landscape on the course of the battle. Poor staff work, bad communication, wretched tactics, and the erosion of battlefield discipline all characterize the Confederate condition on July 1. They were ingredients in the dreadful recipe that produced defeat for Lee’s army. The battlefield at Malvern Hill is credited by the National Park Service as being "the best preserved Civil War battlefield in central or southern Virginia." Most recent preservation efforts there have been the consequence of cooperative efforts between Richmond National Battlefield Park and the Civil War Trust. The Trust has purchased 953 acres at the heart of the battlefield since 2000. Its efforts have been bolstered by the Virginia Land Conservation Fund, the Association for the Preservation of Virginia Antiquities, and officials from Henrico County. Most of this tract wraps around the intersection of Willis Church Road and Carter's Mill Road. The land includes the starting point for the Confederate assaults on the day of the battle, the Willis Church Parsonage, the ruins of which remain visible today. Recent preservation efforts include the acquisition of the Crew house in 2013. Some 1,332.6 acres of land is protected on and around Malvern Hill to preserve the battlefield, according to the National Park Service. Driving and walking tours, among other services, are offered at the site. See also Battle of Malvern Hill. Sources: Robert E. L. Krick, staff historian, Richmond National Battlefield Park; Civil War Trust civilwar.org; Richmond National Battlefield Park. Recommended Reading: Extraordinary Circumstances: The Seven Days Battles (Library Binding). Description: EXTRAORDINARY CIRCUMSTANCES tells the story of the Seven Days Battles, the first campaign in the Civil War in which Robert E. Lee led the Army of Northern Virginia. One of the most decisive military campaigns in Western history, the Seven Days were fought in the area southeast of the Confederate capitol of Richmond from June 25 to July 1, 1862--and began a string of events leading to the Emancipation Proclamation and the shift toward total war. This book offers nine essays in which well-known Civil War historians explore questions regarding high command, strategy and tactics, the effects of the fighting upon politics and society both North and South, and the ways in which emancipation figured in the campaign. The authors have consulted previously untapped manuscript sources and reinterpreted more familiar evidence, sometimes focusing closely on the fighting around Richmond and sometimes looking more broadly at the background and consequences of the campaign.